As participants in the My Health Life network, students become the makers of interactive web-based games to share their knowledge on health issues such as nutrition, exercise, HIV/AIDs and malaria. My Health Life is the latest thematically-focused Globaloria network. Like My Global Life and My Science Life, it uses open-source applications of social media technology and game production, to enhance learning, innovation, entrepreneurship, and an understanding of the world in economically-disadvantaged and technologically-underserved communities. 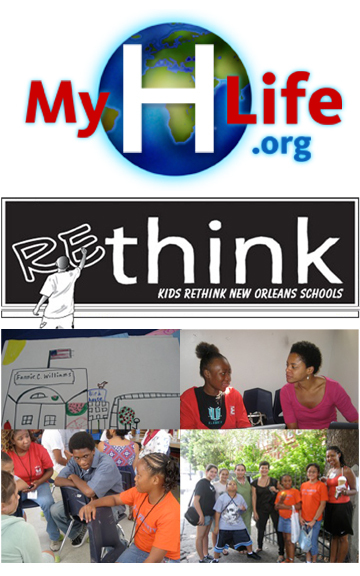 The first pilot for MyHLife was conducted in New Orleans in the Summer of 2008, in collaboration with Rethink, an initiative founded in 2006 in response to Hurricane Katrina - with the purpose of helping low-income young people whose lives have been devastated by Katrina to: (1) develop the insight, vision, and voice to move from being "powerless victim" to resilient, capable achievers and leaders; and (2) rethink and bring about improvements to the public schools. Using the MyHLife platform and curriculum (in beta version), a group of 10 RETHINK summer-campers conceived, designed and programmed in Flash a web-game for an interactive media campaign for a Press Conference about the provision of healthier food in New Orleans School Cafeterias that supports both healthier lifestyles for students, and at the same time, sustains the local Gulf Coast economy. They presented their game The Ultimate Lunch Tray to local reporters and school officials at a News Conference at the end of the camp. The game has been used since as an advocacy tool by the Rethinkers to change policy relating to school food. Learn more about becoming a Globaloria partner.